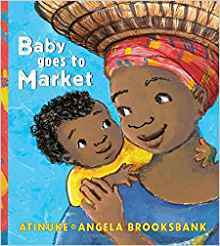 Atinuke is the author of the new children's picture book Baby Goes to Market. Her many other books for kids include the Anna Hibiscus series. She grew up in Nigeria and England, and now lives in Wales. Q: How did you come up with the idea for Baby Goes to Market? A: It’s an idea which I have been working on for years - the idea of a baby, and a market - and it suddenly came together in London when I saw a cheeky little toddler tied on his African mother’s back - the story came together in that instant - and I wrote it down on the bus home. 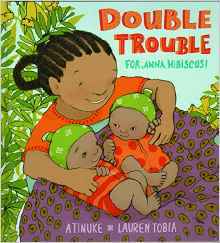 A: I’d like the book to give children both a little glimpse of market life in West Africa, and a lovely giggle at Baby and Mama’s misunderstanding at the end. Q: What do you think Angela Brooksbank's illustrations add to the book? A: Angela’s illustrations bring the story alive. She shows the cute cheekiness of baby and also gives children an experience of the colour and chaos of a West African market. 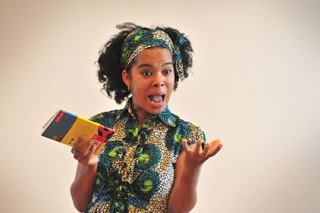 A: I love so many genres of books… Right now I’d say… Ifeoma Onyefulu for all of her work, Joyce Lancaster Brisley who wrote Milly Molly Mandy, Adaobi Tricia Nwaubani for I Do Not Come to You by Chance, Astrid Lindgren for Clarston on the Roof and The Brothers Lionheart, Nnedi Okorafor for Akata Witch, Jennifer Donnelly for A Gathering Light and Revolution, and Chimamanda Ngozi Adichie for everything she’s written! Oh, and Teju Cole - I love Teju Cole for Every Day Is for the Thief! A: I’m working on so many things! Some fun new picture books, a non-fiction book about Africa, an early chapter book, and a novel for teens! A: The chapter book that I am working on is a first for me. It’s my first book that's not set in incredible Nigeria where I spent my childhood. It’s set in wild Wales where my own children are growing up. And there is also a picture book set in Paris coming out! --Interview with Deborah Kalb. Here's a previous Q&A with Atinuke.